L'Oréal Professionnel is synonymous with excellence in the world of haircare, inspiring trends and supporting salons worldwide since 1909 (yes, since 1909!). This is likely why their L’Oreal Colour Trophy competitions in the UK and Ireland have seized the title of of the world’s longest running live hairdressing competition, and attract the brightest hairdressing talents year on year. In December 2016, we began working with L'Oréal on bringing the Colour Trophy admission process fully online. Until this time in the competition’s 63 year history, entries were still being sent by post, which required a large amount of resources on behalf of the events team and the salons entering the competition. This no longer reflected the modern, high-fashion nature of the competitions and events themselves. 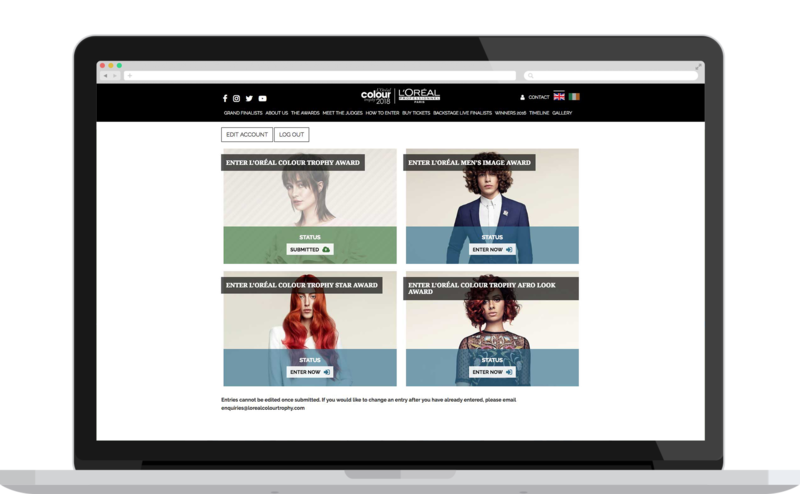 Formulate partnered with L'Oréal Professionnel’s Events and Digital teams to create a stylish and intuitive application system. After several workshops with the Events team at L'Oréal to fully understand the requirements of the internal team and of salons, the design and build of one website for each competition got underway, before launching in December 2016 ready for #LCT17. Every stage of the competition is handled through the sites. The new sites include personal ‘salon dashboards’ to allow entrants to manage their applications with ease, saving their progress and returning at any time. The CMS acts as a kind of CRM for the events team, who can manage all aspects of applications and progress successful entrants through to the next round, who are automatically announced on the front end of the site as a finalist or winner. Users can even buy tickets to the finals through an Eventbrite integration, and continue to come back to the site to browse the gallery, timeline and more.